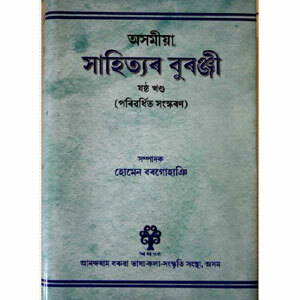 This is the sixth of the six volume history of Assamese Literature produced by ABILAC. This volume has been edited by Homen Borgohain. This book comprises thirty one different articles on various important aspects of Assamese literature and its history. The first edition includes the period from 1939 to 1990. The revised and enlarged edition now contains the History of Assamese literature upto 2010.The learned contributors to this volume are Kabin Phukan, Jogendranarayan Bhuyan, Tirtha Phukan, Gobinda Prasad Sarma, Nalinidhar Bhattacharya, Udoy Dutta, Sailen Bharali, Mira Devi, Anjali Sarma, Kishore Bhattacharya, Pradip Acharya, Manorama Barua, Upendranath Sarma, Pona Mahanta, Dambarudhar Nath, Karabi Deka Hazarika, Hirendranath Dutta, Ranjit Kumar Dev Goswami, Upashree Goswami, Shyama Prasad Sarma, Pabitra Borgohain, Bisweswar Hazarika, and M. Kamaluddin Ahmed. Apart from these chapters, the book also contains a general introduction by the Late Prof. Prafulladatta Goswami, the General Editor of the volume and an introduction by the editor Homen Borgohain.